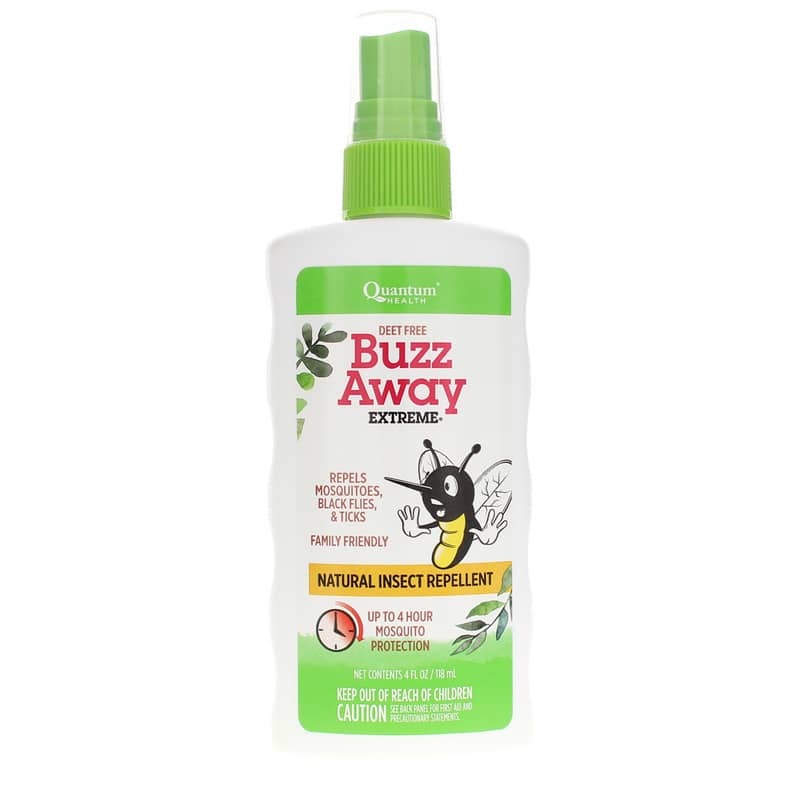 Deet-Free Buzz Away Extreme from Quantum Health is a travel-size natural insect repellent that combines essential plant oils with soy bean and geranium oil for long lasting natural protection from mosquitos, ticks and more! 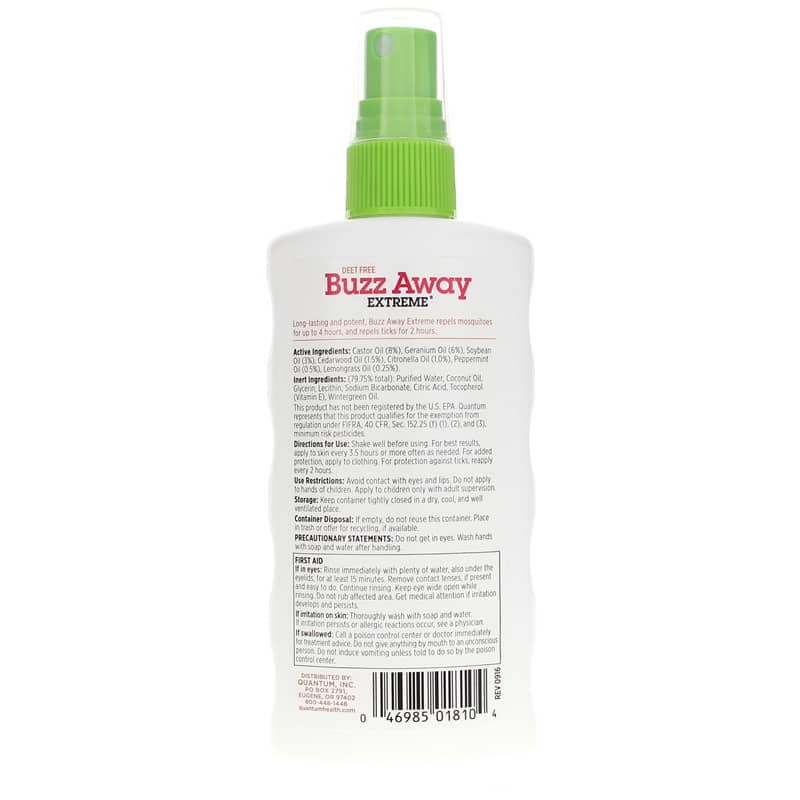 Buzz Away Extreme works up to 4 hours against mosquitoes, up to 2.5 hours on ticks, and also repels fleas, gnats and flies. Natural Insect Repellent for mosquitoes, black flies and ticks! Made with natural ingredients and essential plant oils including soy, geranium, cedarwood, citronella, peppermint, eucalyptus and lemongrass. Smells great and is gentle on skin - Great for the entire family. While keeping mosquitoes and ticks away, if can also help protect you from the diseases they carry. Fisherman - did you know DEET repellents repel fish too? It is true - but not Buzz Away. Why risk using chemical products when this natural repellent is equal to the job. Inert Ingredients (79.75% total): Purified Water, Coconut Oil, Glycerin, Lecithin, Sodium Bicarbonate, Citric Acid, Tocopherol (Vitamin E), Wintergreen Oil. Adults: Shake well before using. For best results, apply to skin every 3.5 hours or more often as needed. For added protection, apply to clothing. For protection against ticks, reapply every 2 hours. Avoid contact with eyes and lips. Children: Do not apply to hands of children. Apply to children only with adult supervision. Do not get in eyes. Do not apply to hands of children. Wash hands with soap and water after handing. Keep out of the reach of children.